Discussion in 'The Sound Hound Lounge' started by Sidney Vicious, May 6, 2016. Stevie Wonder was rained out at the Jazz Fest this year - the Fair Grounds flooded with a monsoon and lightening - but he stuck around town and played a couple of nights at a local club. I missed it all but enjoyed this read - laughed at the "I'm blind - you can't read the look on my face." Wonder was finally seated near the stage. He’d be off and on that stage for the next two hours, starting as he had left off at the Fair Grounds: leading a “Purple Rain” singalong. He played harpejji, an electronic guitar/keyboard hybrid, and piano. He riffed on the New Orleans classics “Mother-in-Law” and “You Talk Too Much.” He honored Mayfield’s request for “Ribbon in the Sky.” He applauded Troy Andrews’ trumpet solo during “St. James Infirmary,” then added his own harmonica solo. 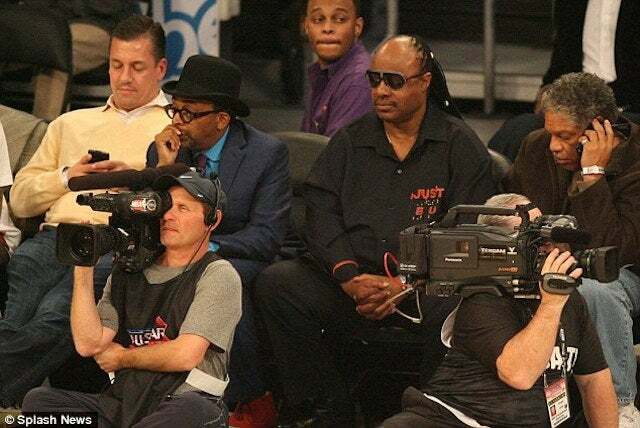 Stevie Wonder is a national treasure indeed. A little story (don't mean to sidetrack) but I signed up for a jazz gig about 3 months ago and had to learn a handful of standards along with some Wonder tunes (You are the sunshine of my life, Signed sealed delivered, Knocks me off my feet, Love's in need of love today, Overjoyed). Wow, what great (and challenging ) chord progressions. I suddenly realized I needed to start really brushing up on my jazz comping skills to get all of these songs right. To be fair I'm really a Rock, country, R&B guitar player who dabbles in jazz every now and then. Learning these Stevie Wonder tunes made me appreciate what a musician he was. To play these fine 'jazzy' chords, sing over them, play the harmonica and turn them into hits was just incredible. I understand now what the hype was all about. Love the guy. Ethn Hayabusa, Sidney Vicious, marvin cobain and 1 other person like this. As old as he is now, his voice is still amazing. Ethn Hayabusa and JiveTurkey like this. Jeri Brown, Stevie's drummer, has few stories aside from " You cannot sandbag any chart in this band, because the boss has played them all!" He told me about arriving at the Wonder warehouse/rehearsal facility in LA. Jeri opened the door to the main room, an SW was at the far end, at least 100 ft away. "Jeri, come on in, and who is that lady with you?" Brown had brought a guest who was wearing flat shoes, and the hallway to the door was carpeted. The distance was too great for her perfume to tip him off. Jeri still doesn't know how Stevie knew. A deeper part of my personal DNA then even the Beatles, Stones or James Brown. deluxeman and JiveTurkey like this. I'm not surprised by any of these stories. Stevie's got that mysterious "something" that only true musical geniuses have. He was born to play, and whether or not he could see the instruments had no bearing on it. deluxeman and Ethn Hayabusa like this.